Frank Turner plays Manchester Ritz next Thursday night headlining a Street Noise charity concert for Big Issue North, an organisation dedicated to alleviating the homelessness problems of Manchester and other major towns and cities. We caught up with Frank to talk about how he got involved, his memories of Manchester and his plans for his next album. You're headlining the Street Noise event at The Ritz. Could you tell us a little about it and how you came to be involved? The people at Big Issue North got in touch and asked if I'd be up for a benefit show for them. I've done a bit of stuff with Shelter in the past, who have educated me a little as to the issues around homelessness, so I'm keen to do what I can do help out. Will the show be solo or will you have the band playing with you? The show is solo, just me and my guitar, though I have some friends on the bill too, Felix Hagan & The Family. You've played most of the venues in Manchester over the years. Do you have any particular favourite memories? Manchester has always been good to me - it's always the first show of a UK tour to sell out, which makes me like the place! I've played a lot of places, the Night & Day has a special place in my heart. Actually, recently we were in town with Blink 182, the show at the Arena was pulled because of the recent tragic events, so we did a show at Castlefield Bowl instead. The atmosphere was magic. You're also playing The Monarch in London. Do you get an extra sense of excitement going back to playing smaller venues rather than the academies and arenas? I like to play anywhere that will have me, for the most part, and my usual concern is to fit the venue to the demand for tickets so people aren't excluded. That means I usually play medium or big size places in the UK these days. But small shows are fun too. The Monarch is run by my flatmate, and that show is also a benefit, so that'll be fun. Earlier this year you celebrated playing your 2000th gig. What made you keep count and did you ever think you'd hit such an impressive milestone? I started keeping count at the beginning, just out of idle curiosity really. Over the years I've played a lot of shows and the count has basically assumed a life and personality of its own. 2000 was a fun milestone to mark, but I don't want any one show to be more important than an another just because of an arbitrary number. You've played Cambridge Folk Festival this year and you've Reading and Leeds for the last ten years. Quite a contrast. Do you feel that ability to play both without raising too many eyebrows has been a help or a hindrance as it stops the business putting you in a nice box? No Reading and Leeds for me this year alas, though it's the first year I won't be there for 10 years. Time for a break maybe. But yes, I have played a lot of different festivals and shows over the years. I'm kind of proud that what I do isn't so easily categorizable. I like to think it shows breadth of artistry. You've been very vocal about supporting groups like Safe Gigs For Women amongst others. Do you think musicians have a responsibility to help make others aware of things that matter to them and does it disappoint you that many new bands seem to have no opinions about anything? I'm wary of telling anyone else how to think or act. What any given artist or band chooses to support or not support is entirely down to them. Personally, I try to be vocal about the things I think are important, and to use whatever platform I have in life to draw attention to those things. It's two years since the release of Positive Songs For Negative People. Can we expect new music from you soon? Yup. I've been working on recording new songs this year. The new album is going to be pretty different, so I'm taking my time making sure that it's right, but it'll be out at the start of next year, all being well. And will you be playing any at the show? Maybe. A gentleman never reveals his setlist in advance. Any final message for aspiring musicians out there who look at the hard slog you've had to get where you have but expect to be signed and successful immediately? Getting signed is the beginning of the hard work. Being a successful musician involves graft, but it shouldn't feel like that because you should love what you do. Knuckle down and make your own luck through hard work. 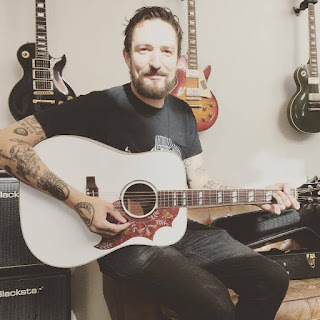 Frank Turner's official website can be found here. He is on Facebook and Twitter.